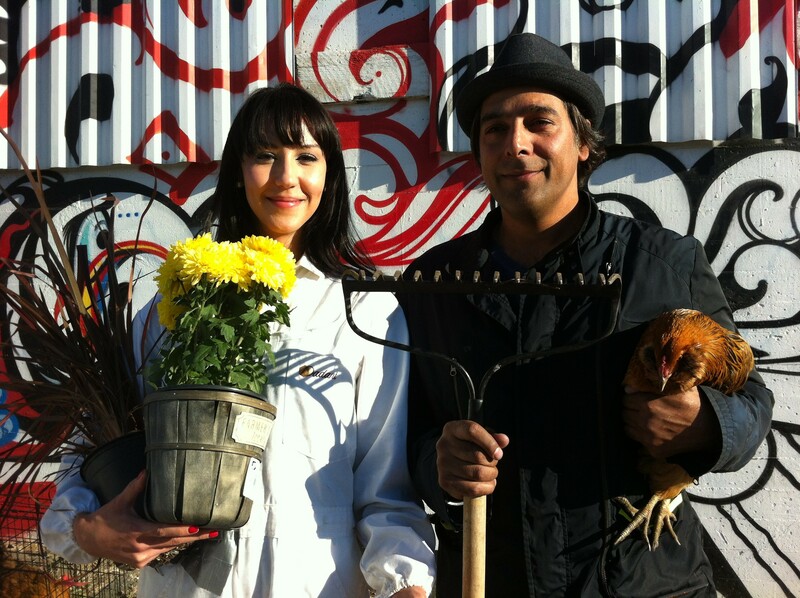 Alameda resident Harvindar Singh (right), a local forager for Whole Foods, will co-host The Urban Homesteader. If you have any doubt that urban homesteading is hot in Oakland, all you have to do is take a quick survey of all the DIY workshops and retail stores dedicated to the arts of beekeeping, raising backyard chickens, preserving foods, and various and sundry permutations of what I think of as “advanced” gardening. These days, it seems as if every sustainability-minded urbanite fancies him or herself a farmer. Now, the topic will be the focus of a new web series from the producers behind such well known educational programs as Bill Nye the Science Guy and Biz Kid$ (a PBS show that teaches pre-teens about entrepreneurship). Fresh off a successful crowdfunding campaign, The Urban Homesteader is tentatively slated to debut its first episodes in October 2015, with the eventual goal of becoming a full-fledged PBS television series. Oh, and the show will be set — where else? — right here in Oakland. The Urban Homesteader is the brainchild of co-producer Jeannine Glista, the Biz Kid$ executive producer, who has dabbled in raising chickens, pigs, and bees at her home in Nevada City. Given the public’s current fascination with the DIY food movement, she felt the time was ripe for a show on the topic — and what better place to film it but in Oakland, whose distinct urbanity (“It has the best graffiti walls!” Glista gushed during our phone interview) and proximity to so many companies involved in the aforementioned movement made it an ideal fit. The goal, Glista said, wouldn’t be for the show to “take over” the urban homesteading space, but rather to celebrate all the interconnected grassroots movements — “to bring it so it becomes more mainstream.” In each episode, the show’s two co-hosts will visit an urban farming expert to learn about some topic — for instance, how to raise goats or smoke meat. Then, they would go home and try the concept out themselves. According to Glista, the show’s target audience will be millennials who have moved to the city, to whom the sustainable DIY movement resonates. Each episode will be an “easy, bite-size chunk” meant to inspire viewers to go out and try something new, she said. And while that kind of digestible snippet might not seem like the best way to achieve mastery of something as involved as, say, raising chickens, The Urban Homesteader isn’t really intended to make anyone an expert. For those who want to go deeper, phase two of the project will set up a network of local classes and workshops for interested viewers, Glista explained. The Urban Homesteader - Sizzle Reel from Jeannine Glista on Vimeo. Of course, this is TV — or aspires to be eventually, anyway — so much of the series’ success will depend on how charismatic its stars are. Toward that end, Glista recruited Harvindar Singh to be one of the co-hosts. Singh is an Alameda resident who works as the “local forager” for Whole Foods Market Northern California. (Note that Whole Foods is one of the show’s corporate funders, along with the magazine Mother Earth News.) Singh’s day job sends him to obscure farms all over the state in an effort to identify new suppliers for everything from barley (to be used eventually for beer production) to olive oil. In an interview, Singh told me that he’s lost count of how many chicken farms he’s visited. Given his background, Singh doesn’t quite fit the "everyman” profile that I imagined when I first watched the show’s four-minute promotional trailer — i.e., the bumbling city slicker with no clue about the most basic principles of farming. But Singh said he’s far from an expert on the topics that the show will likely cover. His hope is that the show will be a vehicle for deep ancestral knowledge — about, say, food preservation or animal husbandry — to be passed on to a mainstream audience. “We all used to be ‘urban homesteaders,’ but over the years we became addicted to the industrial food system,” he said. The show’s other co-host has yet to be cast — “Caroline,” seen in the above video, was an actress hired for the purpose of filming the trailer. The Urban Homesteader recently completed a $20,000 fundraising campaign that will finance the production of the first two webisodes. From there, Glista said, the hope is that the show will grab the attention of a potential full-fledged corporate sponsor. After all, the estimated budget to film thirteen full-length episodes for PBS is $1.5 million. Correction: In the original version of this report, we misspelled Harvindar Singh's first name.